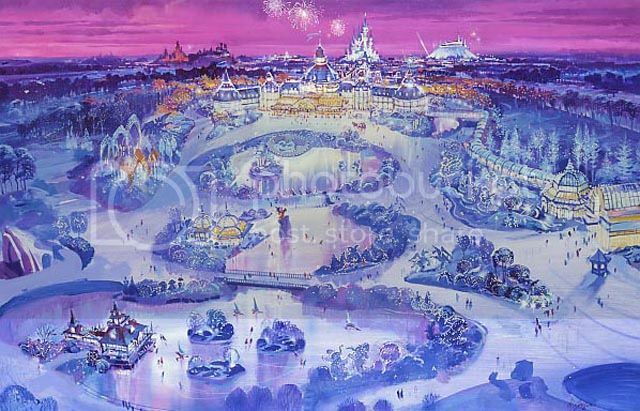 The great Disneyland Paris "From Sketch to Reality" book include 750 pictures as well as 250 renderings from Walt Disney Imagineering but those of you who don't already own the book might not know that you'll find also in the book many artworks showing the "Disneyland Paris that never was"! 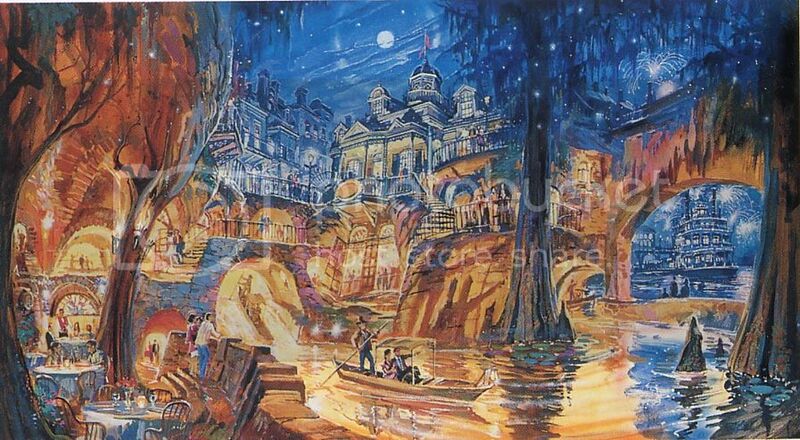 I will show you today some of them, beginning by the beautiful artwork above showing a winter scene of DLP entrance as envisioned by WDI Imagineers. 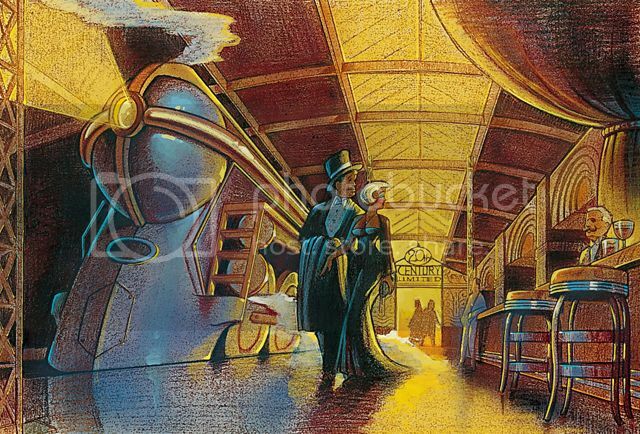 The next one below is part of the concept-arts for the very first concept of Main street, and we were at two fingers to have at DLP a really different Main Street than the one which exist now. 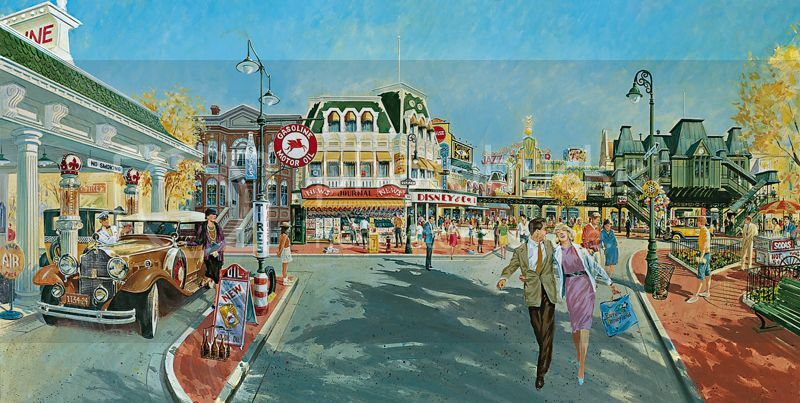 Instead to have a “turn of the century” theming, Eddie Sotto, Main Street show-producer, had designed a Main Street set up at the 1920’s-30’s, at an era which was ruled by gangsters but also the golden era of jazz and cinema, and it would have been a totally different design as you can see on the Colin Campbell artwork below. 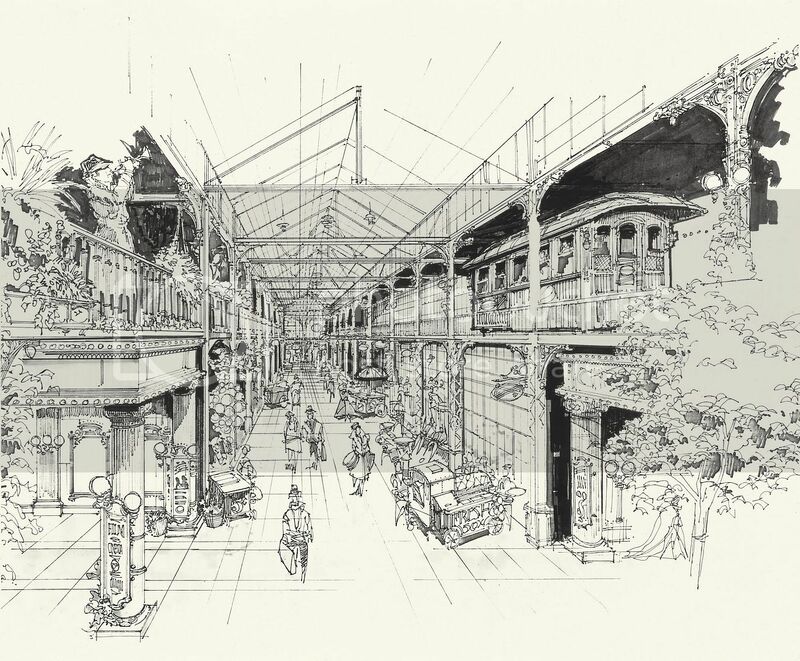 Another artwork, this one by Eddie Sotto himself, is showing the elevated tramway concept, going all along Main Street and inside the MS arcades. 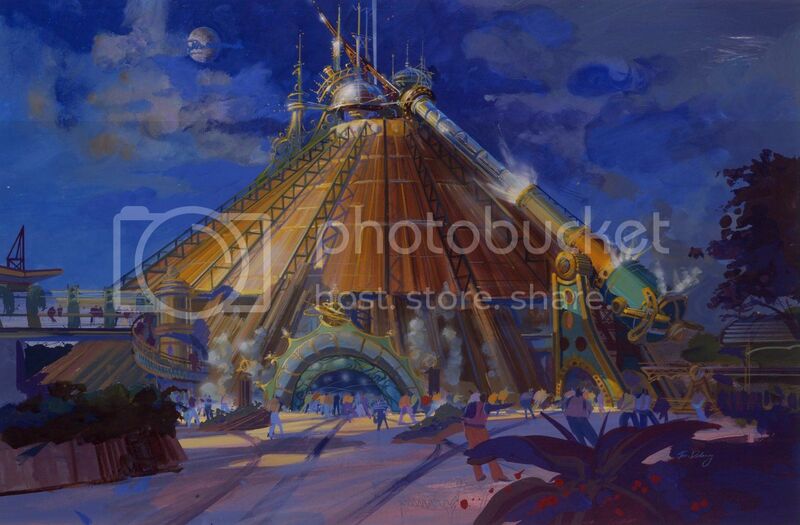 The idea of the elevated tramway was finally realized at Tokyo Disney Sea in the American Waterfront area. Always in that 1930’s theming, a luxurious art-deco restaurant - a kind of private“club 33” -located behind the Main Street Transportation Co. building was envisioned and would have give you the feeling that you’re dining on a train. 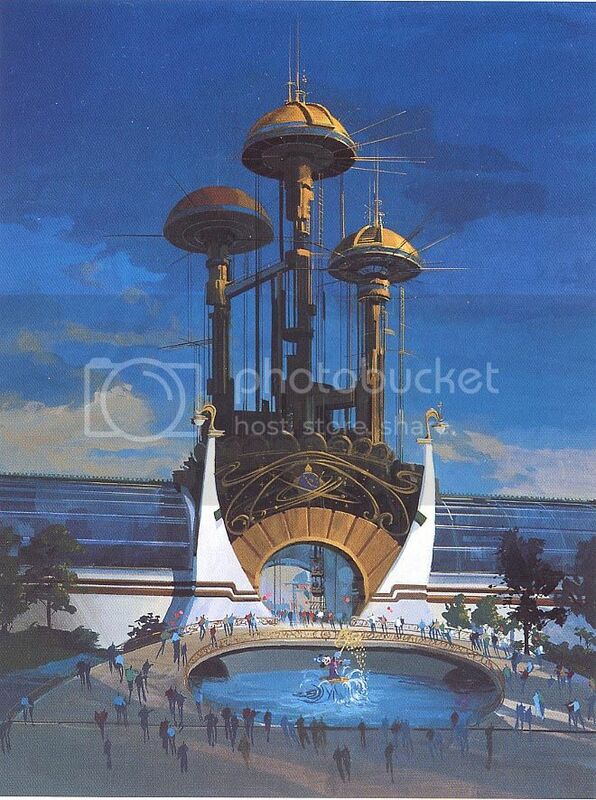 One of the most amazing concepts for DLP castle was the one looking like a futuristic castle designed by Tim Delaney. 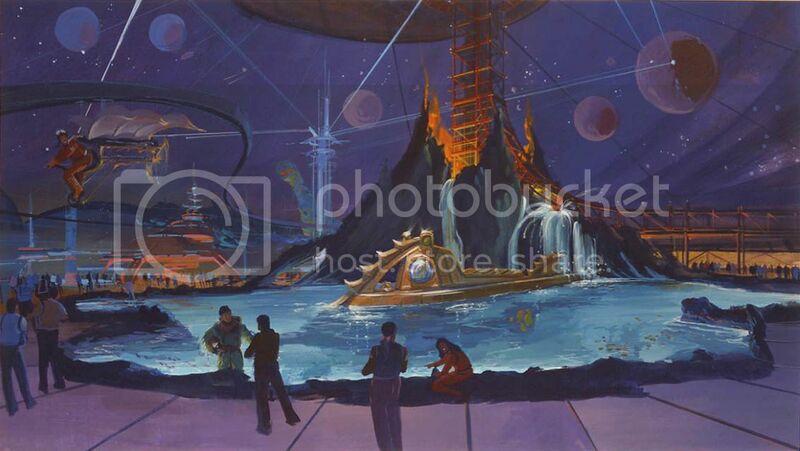 ...in which you would have found not only the Space Mountain coaster but also the Nautilus submarine as well as a Journey to the Center of the Earth drop ride - the vulcano that you can see in the background of this Tim Delaney artwork. 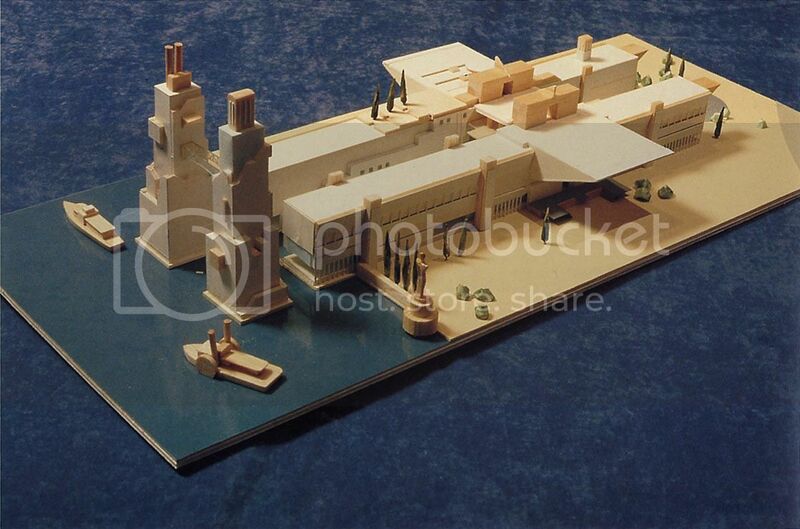 ...or this amazing concept for one of the hotels of the park which was designed with the shape of an aircraft carrier by austrian architect Hans Hollein. 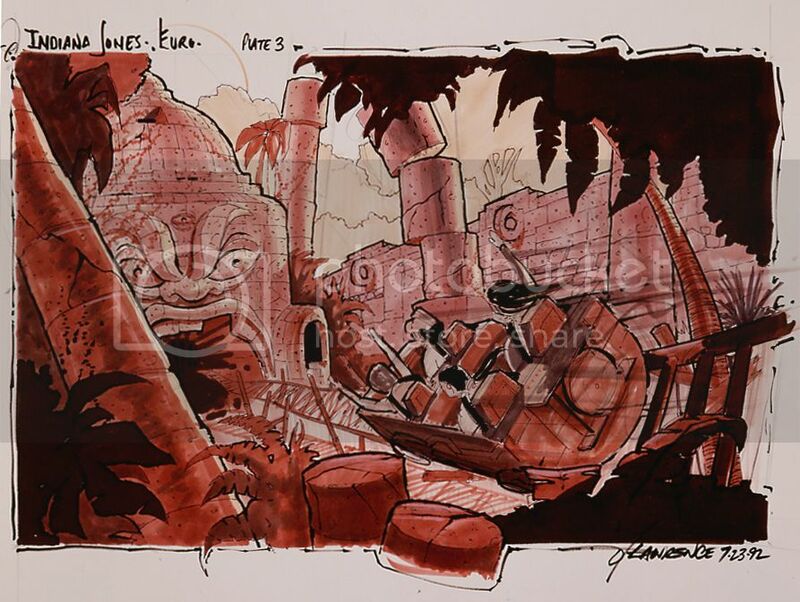 There is dozens more of these "DLP that never was" artworks in the Disneyland Paris book, all fascinating and, with the special pre-order price for the upcoming english regular edition, that's one more good reason to pre-order your copy right now. English regular edition will ship in 2-3 weeks from now and collector copies are shipped in the next 48 hours. You'll find below the video showing you each page of the book and to place your order in one click with Paypal use the Paypal button below, with which you can choose between the regular or collector's edition of the book. Please send me also your shipping address by email at: neverlandeditions@gmail.com Note: if you don't have Paypal, payments by bank transfer are accepted, thanks to send me an email to have the bank infos. I enjoy this blog so very, very much :) Reading it every week. Thank you for all your work, and please do keep it up!! Those photos are incredible! I was lucky enough to visit DLP in 2006, and it still is pretty amazing. I can't imagine having all those attractions inside one mountain. The upper-level train would also be amazing. Thanks for posting them! That book is still too pricey for me, though it looks awesome. I've owned this book for quite a while (probably upon first release). I wish every Disney park received coverage like this in a book of this level. Absolutely one of the best and most beautiful books ever published about a Disney park or resort.